Perspectives After School Program is back in full swing at the Vinalhaven School. The program, which serves students in grades K-5 has lots of fun planned for the year! Session One, All About Seaweed kicked off this month. Yvonne Thomas has been the guest teacher, and we got the kids outside as soon as we could! Yvonne is involved in the instillation of a Kelp Line on the island, that will grow SugarKelp all winter long. Grades 3-5 got to learn all about the kelp line and then headed out to the site on kayaks to sound for water depth. 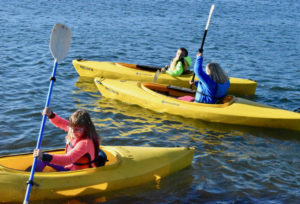 Some students were new to kayaking and were excited to try. Other seasoned boaters were having fun sharing their knowledge.Though the wind was against us, it was a great day! 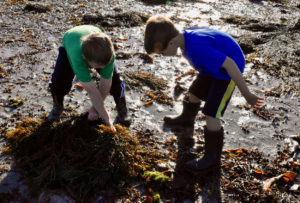 Students in Grades K-2 were able to get out to Lane’s Island Preserve during low tide and hunt for different species of seaweed. They learned all about the different species, what else lives in the intertidal zone, and had a lot of fun in the mud! Students will continue this week with Yvonne, learning more about why we are growing Kelp on the island, and how it is done. A culminating event will take place this Wednesday, October 25th. 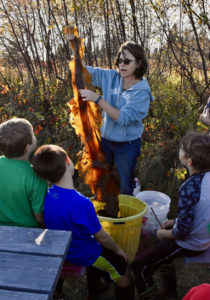 Community Kelp Night will be a chance for different kelp projects to come together. There will be short presentations and a pot-luck meal. Perspectives families are encouraged to attend and all are welcome. We are planning to revisit Kelp in the Spring when it is time to harvest! Perspectives After School is a PIE program, in partnership with Vinalhaven Land Trust and the Vinalhaven School. This year we have a record number of students participating in grades K-2. We explore different subjects each month and look at them from all different perspectives. More week-to-week information can be found on the Facebook site, Perspectives After School. Perspectives this year is led by our Island Institute Fellow, Hillary Savage, and we’re excited to welcome Janica Barrows to the team! Janica works in the Pre-K and K classrooms at Vinalhaven School. We are sad to be saying goodbye to team member Maddey Gates this month, but are excited for her and her new adventures off island.